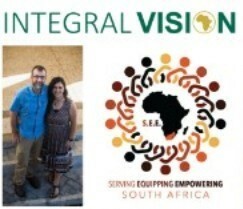 Tony and Maria Verlaan serve with Integral Vision (NTM) to assist the ministry of the local church through the mobilising, equipping, and coordinating of believers to evangelise the world’s least reached peoples, translate the Scriptures, and see indigenous churches established that glorify God. This has been their purpose since they arrived in South Africa in 2010, and it has not been easy. There have been many obstacles, one being “mission fatigue.” Just about every organisation you can think of is in South Africa. At first, people just added them to the long list of missions. But after a lot of research, exploring, talking (drinking coffee), people started to see that Integral Vision (NTM) is one of the few organisations that works with the least reached people groups, to fulfil the above purpose. Incidentally, of the world’s 16,562 people groups, 6,741 people groups have yet to be “reached”. Only around 10% of missionaries are reported to be working among unreached people groups while 90% work among the already reached people groups. This has given Tony and Maria an inroad to speak at conferences, churches, and Bible colleges. God is raising up people from southern Africa to be a part of the 10% mentioned above. It has been slow going, but there are now five people in different phases of the training. They cannot minister in this way without firstly God’s enabling and secondly your prayers and support. So, please do continue to pray for them. Wisdom, as training people in three locations and in two countries is not easy (they are thankful to have a team to do this). For those in training and those to start later this year. All of them still work and are very involved in their churches, so please pray for them as they fit life and ministry around the training. The team, as they are scattered through South Africa, pray for unity and good communication. Them as they seek God as a team for His leading to raise up more labourers. Tony as he continues to teach at the Bible college.